Syrian President Bashar al-Assad blamed some Western leaders for the terrorism and refugee problems facing Europe. During a meeting on Sunday with the visiting delegation of the European Parliament headed by Vice-President of the Parliament’s Committee on Foreign Affairs Javier Couso, the President discussed the situation in Syria, the terrorist war waged on it and the growing destructive impacts of the spread of terror to world regions. Assad said that what is happening in Syria and the Arab region would greatly affect Europe given the geographical vicinity of the two regions and the cross-cultural communication. He held the leaders of some Western states responsible for the problems of terrorism and extremism and the refugee flows currently facing Europe for having adopted policies that are against the interests of the peoples of these states. The President slammed those Western leaders for providing the political cover and support to the terrorist organizations in Syria. 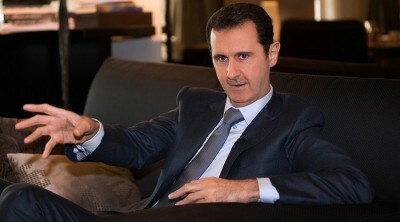 Striking a relevant note, President al-Assad said the European parliamentarians could play a significant role to correct the wrong policies of their governments that have caused terrorism to spread and led to worsening the living conditions of the Syrian people due to the economic blockade they imposed on them, forcing many Syrians to leave their country and seek refuge in other states. For their part, the European delegation members said their visit to Syria and the suffering of the Syrian people they have seen firsthand would make them put effort to the effect of correcting the policies of the European governments and pressuring them into lifting the sanctions. The European parliamentarians affirmed the need to keep Syria’s sovereignty intact, stressing that the Syrians alone should decide their country’s future without any foreign interference. On March 27th, President al-Assad received a French delegation that included parliamentarians, intellectuals, researchers and journalists and said during the meeting that such visits by parliamentary delegations and having these figures inspect firsthand the situation in the Syrian cities could be useful for them to efficiently work to correct the wrong policies adopted by some governments, including that of France, towards what is happening in Syria.